Barium titanate glass is a unique optical glass formulation based on a large percentage of Barium Oxide (BaO) and Titanium Oxide (TiO2), as opposed to other traditional glass formulas which are mostly Silica (SiO2). Barium titanate glass offers a much higher refractive index compared to other glass formulations. Refractive Index is the ratio of the speed of light in a vacuum to the speed of light in the specified material - a description of how light slows down as it passes through an optical material. 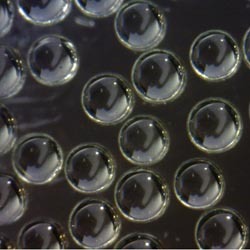 High refractive index microspheres are critical when used for optical systems where high refractive power is required such as endoscopy, micro-optics, defense and microscopy. 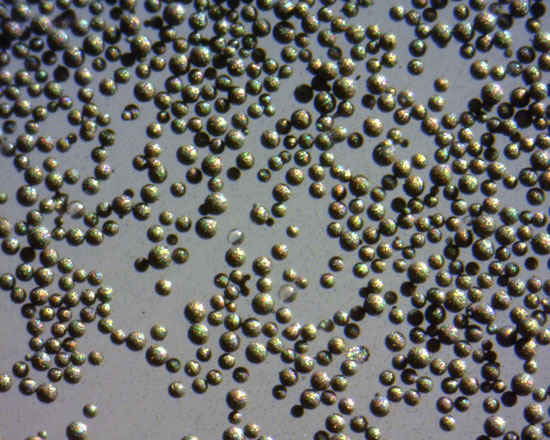 Barium titanate glass microspheres will reflect back more light directly to the viewer. High index of refraction enables retroreflectivity which is often desired in guard rails, traffic signs, reflective paint, tape or clothing. Barium titanate glass hemispherically coated with aluminum ensures that the light bounces off the aluminum-coated half of the sphere and produces the retroreflective effect for high visibility in dark conditions. Please note that this material is barium titanate glass and does not have the dielectric properties of barium titanate powder. Barium titanate glass spheres are desirable due to their high density, durability, and a much higher refractive index compared to other glass formulations. Slightly conductive high density glass particles with thin gold (Au) coating on solid barium titanate glass core. 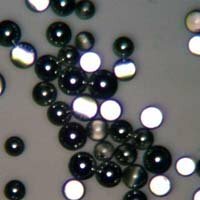 Retroreflective glass microspheres have a half-shell aluminum coating applied to solid barium titanate glass core.